Winter being well know for its cold weather is also reprehended as cold or flu season. And when the little ones get sick, it is no fun. Our little one was down for four days with cold and congestion. It was a stressful week. We were so busy at work. I had no choice other than to work from home during these days. So I was not able to do any major cooking, but had to rely on some easy and quick recipes. Soup was an easy choice to go with. 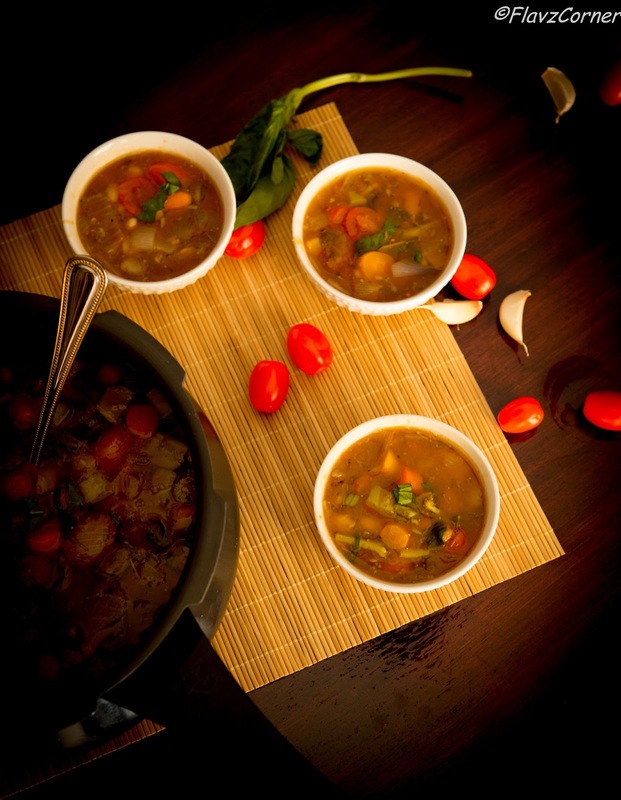 Mixed bean vegetable soup is a well tested recipe in my kitchen. 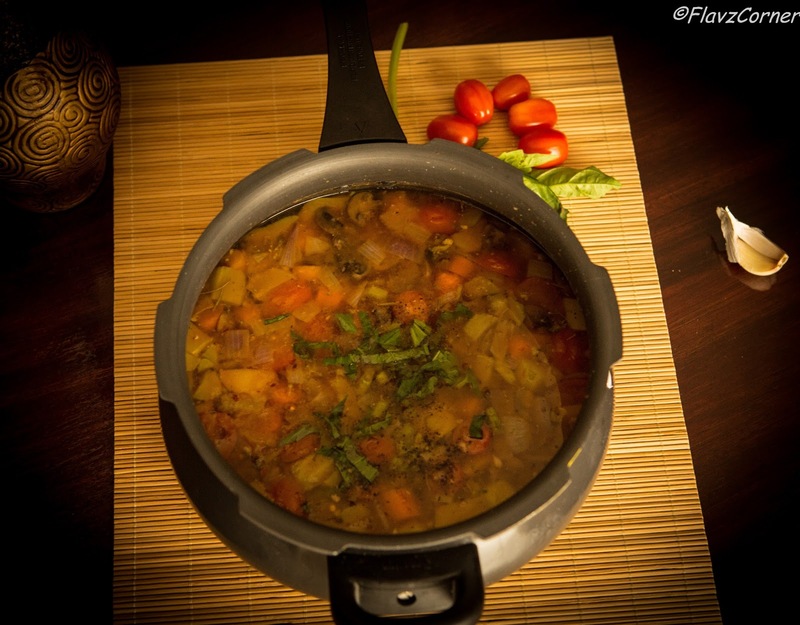 Soup that can be prepared within 30 minutes in a pressure cooker is an ultimate cooking panacea. The nutrients from vegetables and the protein from 13 different kinds of beans will definitely satisfy the requirements for a healthy soup. Preparing something good and healthy is one thing and getting a compliment for what you made is another thing that can be counted as a bonus. Sometimes you don't get a compliment for something that you prepared that tastes good, but you get the satisfaction when people avidly go for the seconds which proves the point. I had the chance to serve this soup to someone who asked me 'Did you really make it?'. It was an untold compliment. My family loves this soup. This is one of those recipes, which is simple yet healthy and tasty and can be prepared within 30 minutes. To me these are some easy breezy dinner ideas which rescues me when I have a long day at work or when I am too lazy. Discard the water from the beans and rinse once. Pressure cook the beans with 3 cups of water for 10-12 minutes or till 3 whistles blows. Turn off the burner and let the pressure subside completely. Meantime heat a saucepan with 2 tsp of extra virgin olive oil and roast the minced garlic till light golden brown. Add the onions, pepper flakes and cook for 2 minutes followed by the 4 cups of vegetables. Saute for couple of minutes and turn off the burner. Add the sauteed vegetables, 2 cups of water, cut tomatoes, salt and pepper to the pressure cooker. If the water is not enough to cover the vegetables, add 1 more cup of water. Pressure cook for 15 minutes till 1 whistle blows and turn off the burner. Wait till the pressure subsides completely and remove the lid. Add the chopped basil and tomato paste and boil for couple of minutes. Adjust the salt and pepper per your taste. If the soup is too thick add water and boil till the desired consistency is attained. Enjoy the warm soup with fresh pull apart bread. 1 cup of dry mixed beans soaked overnight will yield 1 1/2 cups of beans. I normally use Bob's Red Mill brand of 13 bean soup mix. 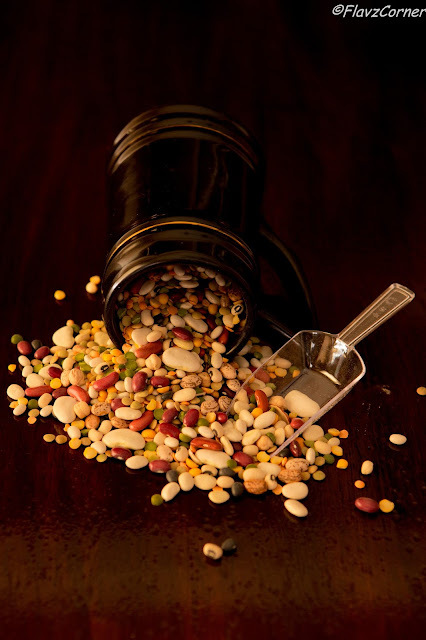 If you cannot find the mixed bean soup mix, substitute it with a mix of navy, black, red, pinto, baby limas, large limas, garbanzo, red lentils, great northern, kidney beans, black-eyed peas, yellow splits, green splits, and lentils. Cut the vegetables into bite size pieces to cook evenly. Use a pressure cooker that holds a volume of 4.5 litres or above. If you forgot to soak the beans, don't worry, you can pressure cook 1 cup of dry beans + 3 1/2 cups of water till 11 whistle comes for 20 minutes. 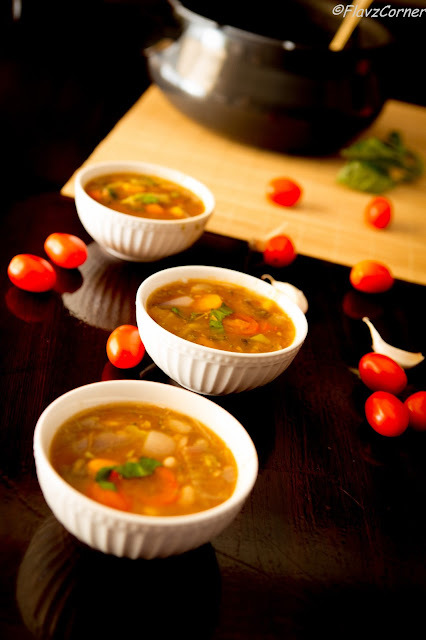 Wow awesome clicks dear, healthy and yummy soup. Love the variety of beans that you have in this! And all the flavors sound wonderful. I love making soups, and you've given me some ideas - thanks so much. Hey Shibi, I made this yesterday, really good.. one of the best soups I have ever made. Thanks for the recipe. Thanks Susan for the comment and for trying it. I am so glad that you liked it. Yes, very special and simple soup for Fall, hot and healthy. Thank you Shibi! Have a lovely weekend!